Low vision can affect people of all ages and can have an impact on many aspects of a person’s life. It may cause problems with recognising faces, reading the newspaper, dialling the telephone or seeing road signs. To find out more, please call Vision Australia on (02) 9053 4585 or find out if you or a loved one is eligible for free support. The Australian Government has recently made changes to the aged care system. This includes the introduction of My Aged Care which is an initiative that supports older people and their families in accessing aged care information and services. over the age of 50, if you identify as an Aboriginal or Torres Strait Islander. Help in your own home such as domestic help, meals or nursing care, equipment or modifications to your home like rails or ramps and access to social activities. Short-term help (or respite care) is available for older people and their carers. Ongoing help for people living in aged care homes. There are different types of aged care services to support you, whatever your needs. Provide you with specialised support services to meet your needs. How do I register with My Aged Care? Contact us early and get the support you need. 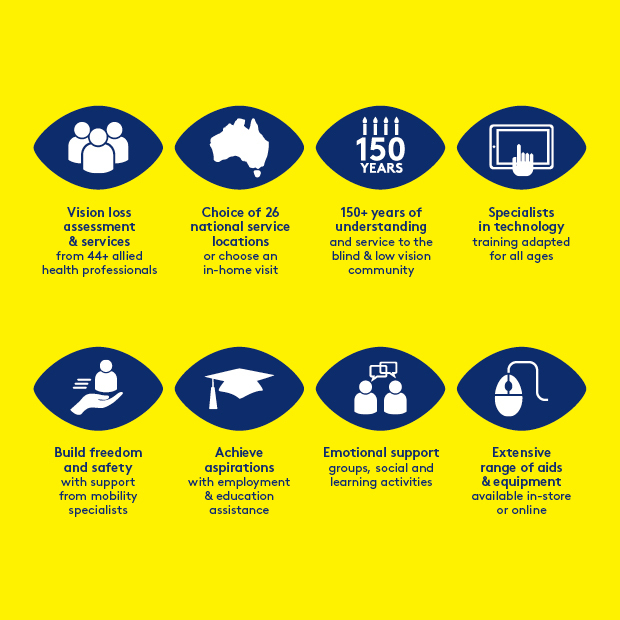 For more information on Vision Australia’s services call our helpline on O2 9053 4585 or email info@visionaustralia.org. You can also connect with our services here. Age related macular degeneration is a degenerative eye condition caused by changes at the back of the eye (retina). 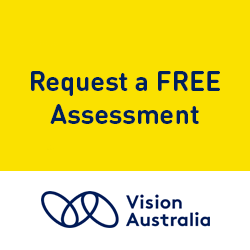 It is the leading cause of severe vision impairment in people aged over 40 years in Australia. It is also referred to as AMD or ARMD. Diabetic retinopathy is a complication of diabetes which can damage the tiny blood vessels inside the retina at the back of the eye. This can cause bleeding and swelling in the retina and seriously affect vision, and in some cases cause blindness. Diabetic retinopathy is the most common cause of vision loss in people of working age in Australia. There may be no symptoms in the early stages as the damaged areas may only affect the edge of the retina. There may be blurred or distorted vision that makes it difficult to read standard print, watch television or see people’s faces. There may be increased sensitivity to glare and difficulty seeing at night. Peripheral vision may be affected so that driving is no longer possible and there may be an increased risk of falls. Glaucoma is a group of eye diseases in which there is progressive damage to the optic nerve which carries vision information from the eye to the brain. Glaucoma is often associated with high intraocular pressure (fluid pressure inside the eye) resulting from a problem with the drainage system of the eye. Early detection and treatment are crucial to minimise vision loss. If untreated the continued loss of peripheral vision can lead to tunnel vision or blindness. Does anyone have any recent experience with PRK?